Property 13: *Jindabyne Townhouse* Great Value. Has a SAUNA! Jindabyne Townhouse - Best Value in Jindabyne, has a Sauna! Property 19: Jindabyne Townhouse - Best Value in Jindabyne, has a Sauna! Property 25: SNOWCREEK #5 - 1 Bed&Loft - Sleeps 5, Family Friendly in a quiet bush Setting! We stayed here for 3 nights in order to climb Mt Kosciusko. 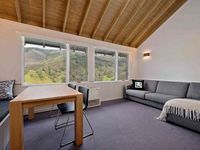 The unit was clean and comfortable, the views were outstanding, and the village and chairlift were a short walk away. We especially enjoyed the heated floor in the main bathroom. You can pay more for fancier accommodations in Thredbo but this fit our needs perfectly. And the hike to Mt K is highly recommended!